This post will help you plan your visit to the East Side Gallery, an outdoor section of the Berlin Wall covered with murals by world artists. We include directions, the best times to visit, what to expect and more. The East Side Gallery is not an actual art gallery, rather it is a 1.3 km (.8 mile) section of what remains of the Berlin Wall. This outdoor ‘art gallery’ runs along Mühlenstraße and the Ostbahnhof, very close to the River Spree. When a divided Berlin was unified in 1990, artists from all over the world came to paint murals on this segment of the Wall. (For a brief history of the East Side Gallery, see the section below). There are over 100 murals created by artists from 21 countries, reflecting the political changes in Germany and the world at that time. The murals are painted in a wide range of styles, from New York-style graffiti to classic Japanese paintings. Here are just a few murals you may see. TIP: If you are interested in the Berlin Wall, its construction, political implications and history, then we recommend also visiting the Berlin Wall Memorial. The most famous mural, known around the world, is pictured below. You can find it located halfway along the gallery, 200m to the left of the Mercedes Arena when facing the river. The artist is Dmitri Vrubel, a Russia-born Berlin artist. It is a mural rendition of an iconic photograph taken in 1979 during celebrations of the 30th anniversary of the birth of the GDR. The photograph is of a brotherly kiss between the former Soviet and East German heads of state, Leonid Brezhnev and Erich Honecker. The mural is known informally as The Kiss. The official name is also the mural’s caption which reads, “My God, Help Me to Survive This Deadly Love”. This mural is a playful, ironic and incredibly powerful reminder of the Cold War years when there were two Germanys, one that was a free democratic state and the other that was a satellite of the USSR’s oppressive communist regime. Although The Kiss may be the most recognizable, the other 100+ murals are unique pieces of art as well and should not be overlooked. The other side of the wall that faces the river is covered in random graffiti. You can see that side as well but take note that there is no exit at the end, and you will have to walk back to get to the street. To get exact directions from your point of departure to the East Side Gallery, click on this link for directions using Google Maps. If you are new to Berlin’s transportation system see our post How to navigate Berlin with Public Transport. TIP: Some Hop-on-hop-off bus tours include stops at the East Side Gallery. You can find out more about the many bus tours in Berlin by reading out in-depth post Which Berlin Bus Tours Are Best? When you leave the station, turn left (south) and walk along Warschauer Strasse until you get to the river (you’ll see the bridge, Oberbaumbrücke, ahead of you. At the river, turn right, cross the road, and walk along Muhlenstrasse until you see the Wall Museum on your left. Just beyond the Museum is the East Side Gallery. You can also go to Berlin Ostbahnhof station. (Buses 140, 142, 147, 165, 240, 248, 265, 347, N40, RB14, RE1). From there it is about a 9-minute walk. The closest stop is the East Side Gallery bus stop. You can take Bus 248 to this stop. From there, it is about a 2-minute walk to the Gallery. 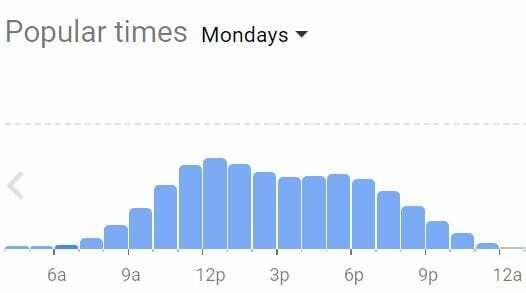 Google’s “Popular Times” charts can help you plan your visit to avoid crowds. Below are charts showing the busiest times on a typical Monday and Saturday. As you can see, Mondays are the busiest from about 11 am – 2 pm. On Saturdays, the quietest times will be before 12 noon or after 9 pm. You can take advantage of the slight slow-down from 2 pm – 4 pm. Click here to check Google Maps “Popular Times” for the Gallery for any day/time you want. When you plan your visit, you might want to include a stop at the Wall Museum, described just below. You can also plan to see some of the nearby attractions described further down in this post. Located a short walk from the East Side Gallery’s south-eastern entrance, the Wall Museum is worth a visit if you are in the area, though some people say that the Checkpoint Charlie Museum is a better museum. Though, we recommend also visiting the Berlin Wall Memorial. Through multimedia exhibits, the Wall Museum explores modern Berlin’s history and the story of the Berlin Wall in its 13 themed rooms. You can see original film footage and interviews about the Cold War era in Berlin as well as the dramatic building of the Berlin Wall in 1961. There is also a souvenir shop. For more information on Berlin Tourist passes, see our post about the various passes, Berlin Pass vs Welcome Card vs City Tour Card? The East Side Gallery runs along the border between two of Berlin’s trendiest areas, Friedrichshain and Kreuzberg. Both are fun to explore. If you do go, check out our self-guided tours Friedrichshain and Kreuzberg. You can also enjoy the River Spree, and in warmer months you can visit Badeschiff, a nearby outdoor swimming pool adjacent to the river. The pool is built so that it feels as if you are swimming in the river itself! The Berlin Wall was erected in 1961. Dividing the city’s East and West German portions, it spanned 155 kilometers (96 miles). The Berlin Wall consisted of two walls: the border wall (the part that faced the West) and the inner wall in East Berlin. Parts of the river Spree also marked the border between the East and West. The murals are on the side of the wall that does not face the river, but rather faces territory that belonged to East Berlin. Between 1961 and 1989, when the East German government collapsed, at least 136 people died trying to scale the Wall and escape the oppressive world of East Berlin to the democratic and free West. The East German government has only just disbanded when artists started their work in Spring 1990. It was an international project with over 100 artists from 21 countries painted murals reflecting the political changes in Germany and the world. Over time, wear and tear have required repairs and touch-ups to the Wall. In 2009, response to the graffiti that was showing up on the murals, the murals received an anti-graffiti coating. 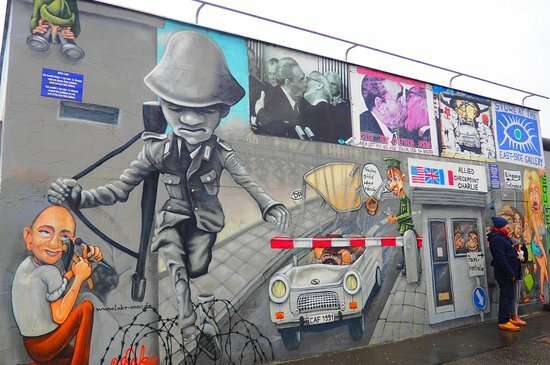 Click here to read more and see pictures about the various threats to the East Side Gallery. In early 2013, there was another threat to the East Side Gallery: a proposal for a luxury apartment house between the Wall and the river. This would require removal of four mural segments of the Wall to provide access to the new development. Thousands of people rallied unsuccessfully to protect the East Side Gallery. In March 2013, construction workers, protected by 250 police officers, removed the four wall panels. The work took place at 5 am, without any notice to the public. Ironically, the sudden and surprising dismantling of this part of the Wall is reminiscent of the way the Berlin Wall was built in 1961 — suddenly and swiftly without any notice. Whatever side of the Wall you were on when the Wall was built was the side of the Wall you stayed until Germany’s reunification in 1990.